Today I am hopping with the Aim for Alaska team run by Kylie Bertucci. Our cards have been inspired by Alaska (colours, nature, animals etc). I've chosen an Alaskan scene for my card. The Aim for Alaska group is full of so many inspiring people, who freely share their business tips with everyone. Kylie does a great job organising regular Facebook Live videos with top demonstrators from all over the world. If you're a demonstrator & you'd like to earn an incentive trip, then I highly recommend that you join our group! Either way, I hope you enjoy the blog hop today & get inspired by all our Alaska themed cards! I just love this mountainside design from the Carried Away Designer Series Paper (DSP). You can get this gorgeous paper & heaps of other great products for free when you place a $90AUD order in my Online Shop. Hurry! This offer is only available until 31 March!! See below for more info. I've used some Metallic Enamel Shapes, Sending Love Embellishments, Silver Metallic Thread & Burlap Ribbon to pretty up the card. You can also see some of the Metallic Combo Ribbon in there, this is another one of the free products you can earn with your $90AUD Online order this month! I've stamped the inside of the card to match & thrown on a couple more Metallic Enamel Shapes for good luck! 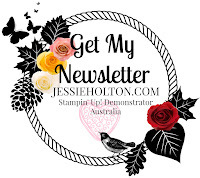 You are currently visiting my blog - Jessie Holton - please see below for the next blog to visit. Hop around & enjoy all the beautiful creations!